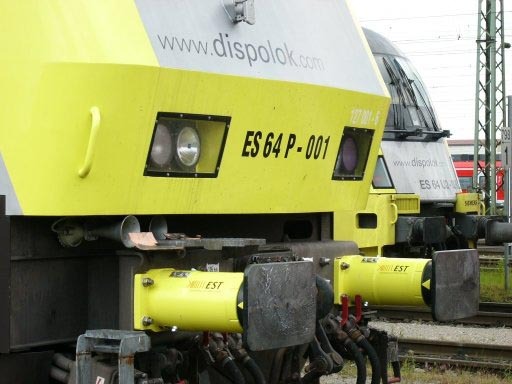 June 2004: SIEMENS Dispolok Eurosprinter 127 001 with EST Crash Buffer. Deformed EST Crash Buffers after a vehicle crash test. The EST Crash Buffer combines a standard side buffer for railway vehicles and an energy absorbing deformation element into a single component. It is its unique feature that the additional function, as a deformation element, is integrated into the casing of the side buffer, so that no additional space is required, not even after deformation has been deployed. 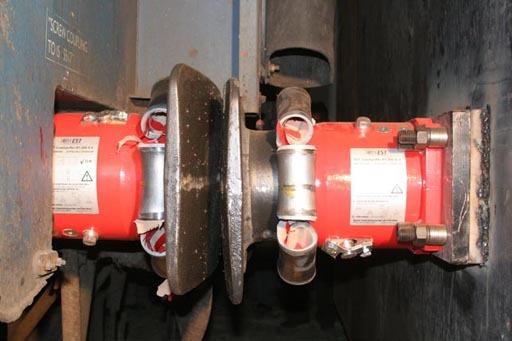 The external dimensions and attachment flange of the EST Crash Buffer are identical with those of a standard side buffer complying with the rail industry standards UIC 526-1 (freight wagons and locomotives), or UIC 528 (passenger carriages). Therefore, the EST Crash Buffer can be mounted to all vehicles that have been designed for standard side buffers in accordance with these standards. It can be used for the protection of high capital cost modern railway vehicles, as well as a retro-fit onto existing older railway stock where enhanced protection is desired. Reduction of repair cost after accidents. Faster return into service after accidents. Protection of staff, passengers and freight. Protection of all vehicles involved in a collision (collision counterpart, train rakes). Avoidance of uncontrolled collision scenarios such as derailment or climbing, therefore, initiating a less hazardous collision sequence. Avoidance of undetected damage as a consequence of moderately severe impacts. The level of collision damage is indicated quickly using correlated witness marks on each buffer unit.